U.S. #793 pictures Dewey with two other Spanish-American war naval heroes – William Sampson and Winfield Schley. George Dewey, the only man to hold the rank of Admiral of the Navy, died on January 16, 1917. Dewey was born in Montpelier, Vermont, on December 26, 1837. His father had helped found the National Life Insurance Company as well as the Christ Episcopal Church in Montpelier. 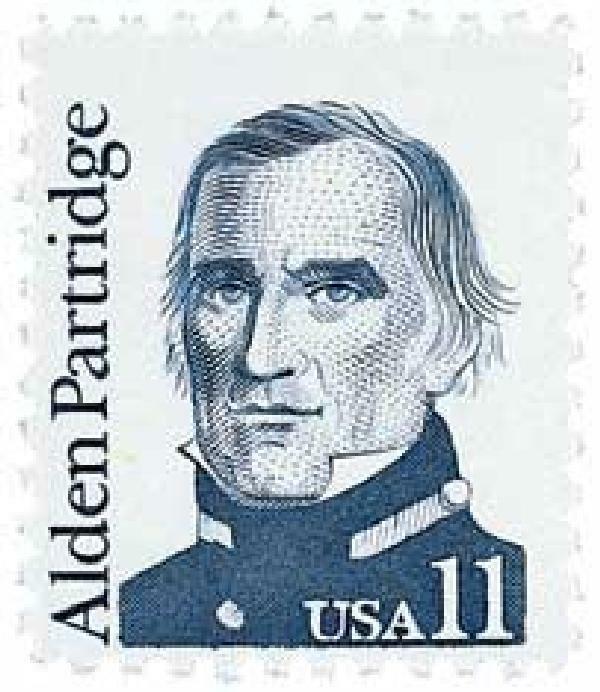 U.S. #1854 – Alden Partridge founded Norwich University, Dewey’s alma mater. At 15, Dewey attended the Norwich Military School, also known as Norwich University. Dewey enjoyed his time there, and adopted the legendary Greek commander Hannibal as his role model after reading his biography. In 1854, Dewey entered the Naval Academy where he was also an excellent student. Four years later he graduated fifth in his class. He then entered his first naval service aboard the USS Saratoga, earning recognition as a cadet officer. After that, Dewey was transferred to the frigate USS Wabash. Aboard that ship he traveled to the Mediterranean and was tasked with keeping the ship’s log. U.S. #4664 – Dewey saw his first major action at New Orleans in 1862. When the Civil War broke out in 1861, Dewey was serving as executive lieutenant aboard the USS Mississippi as part of the Union’s West Gulf Blockading Squadron. 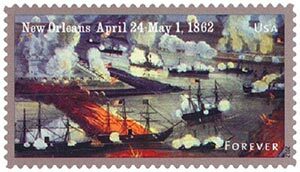 In early 1862, Dewey was part of Farragut’s fleet, which was assigned to capture New Orleans. On the night of April 24, Dewey’s ship was the third in the division to sail up the Mississippi River past Confederate defenses. He skillfully steered the ship through shallow water, despite fears that it might run aground. When the Confederate ironclad CSS Manassas tried to ram the Mississippi, Dewey evaded the attack. He then pursued the Manassas, running it aground before his men set it on fire. 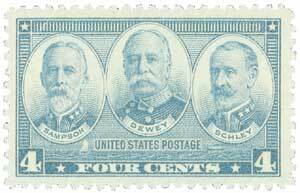 U.S. #951 – Dewey commanded the Constitution from 1867-70. After the Civil War, Dewey traveled to Europe aboard the Kearsarge and later the Colorado. He was then given command of the ships at the Naval Academy in Annapolis. This included a brief command of the famed USS Constitution, which was then serving as a training ship. From there he went on to serve as an instructor at the Naval Academy and secretary of the lighthouse board, among other things. After a few years serving in Washington, D.C., he was anxious to return to sea and was given command of the Asiatic Squadron, just before the start of the Spanish-American War. 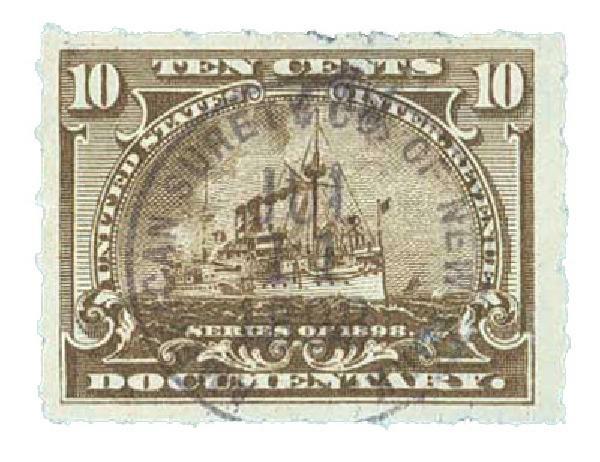 U.S. #R168 – Revenue stamps such as this helped pay the tax on transactions to fund the Spanish-American War. On April 26, 1898, Dewey was ordered to sail to the Philippines to engage the Spanish fleet. The Spanish leader believed that U.S. ships would not attack until morning because Manila Bay could not be navigated safely at night. But Dewey had obtained detailed charts and confidently led his line of vessels through the narrow entrance during the night of April 30. When the sun rose the next morning, the Spanish fleet was surprised to be facing the enemy. At about 5:40 a.m., Dewey ordered “You may fire when ready.” The American boats outgunned the Spanish vessels and coastal forts. By 12:30 that afternoon, the Spanish raised the white flag of surrender. Dewey was hailed as a hero and the Philippines came under American control, eventually becoming a U.S. territory. 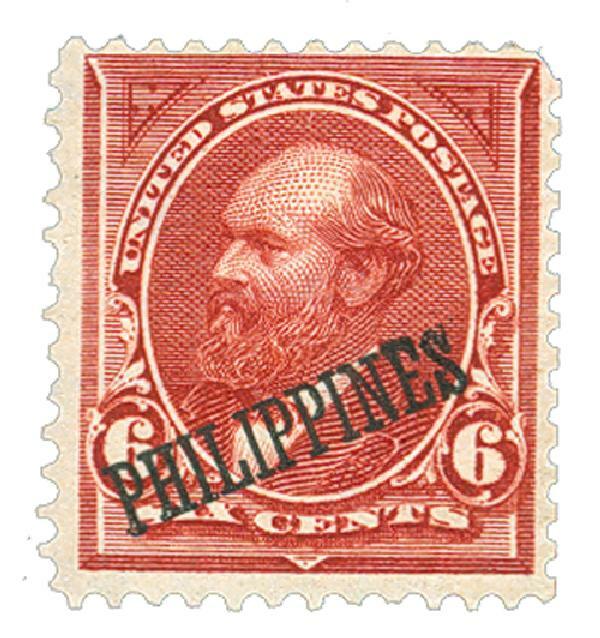 Philippines #PH221 – After the Spanish-American War, the U.S. overprinted stamps for use in the Philippines. Dewey returned home a hero and was honored with a two-day parade in New York City. In 1903 he became the first and only American promoted to Admiral of the Navy (similar to General of the Army). After a brief attempt at running for president in 1900, Dewey was made president of the General Board of the Navy Department, a position he held until his death on January 16, 1917. This entry was posted in January 2016, This Day in History. Bookmark the permalink. 13 Responses to "This Day in History… January 16, 1917"
achieved that five star rank during WWII, but were called Fleet Admirals. As a former Navy guy I loved the write up. And to see the collection of stamps in one place. Thank you for the story on this American hero. Sometimes the word “hero” is overused, but not in the case of Admiral Dewey. There are also some interesting Camp Dewey poster stamps with the Admiral’s profile picture on them. As were Adms. Leahy and King. Hannibal was a Carthagenian general not Greek, surely? RIP Admiral Dewey. Thanks, Mystic, for a great historical update, even with the little mistake about Hannibal. Ooops! Being a Naval vet, I really enjoyed this one. Thanks. A degree of Seamanship rarely observed in modern war times…..Hungry for battle he took it to the fight. Well deserved recognition. Very Interesting detailed chronology…Thanks. Gee, I thought Admiral David Farragut was the only Admiral of the Navy. Interesting that he is not mentioned although Admiral Dewey served under him. my brother served on, ended up with before he died. This Army guy really loved the well written write up. I enjoy reading this daily post. 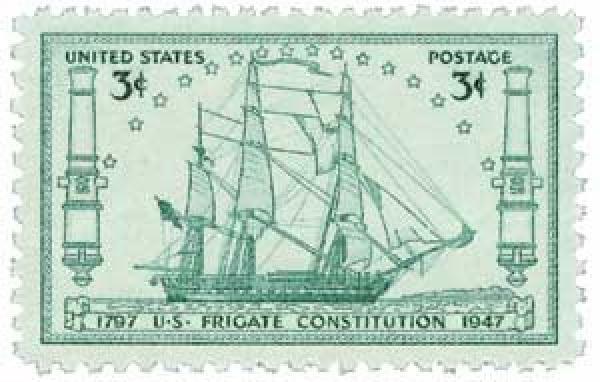 I kind of wish I could buy a book of these post and then order the stamps, now that would be nice collection.